Being that bridge between jazz and blues, T-Bone had lots of jazzy elements in his playing: not a lot of bending, use of the 9th and other ear grabbing chord tones. 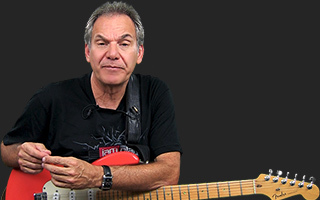 Stuart uses a simple, bluesy harmony over this shuffle feel to demonstrate these qualities. Thank you for this lesson, Stuart. It was very challenging for me to get the phrasing down but so rewarding when I did! Love T-Bone's distinctive and joyful style.